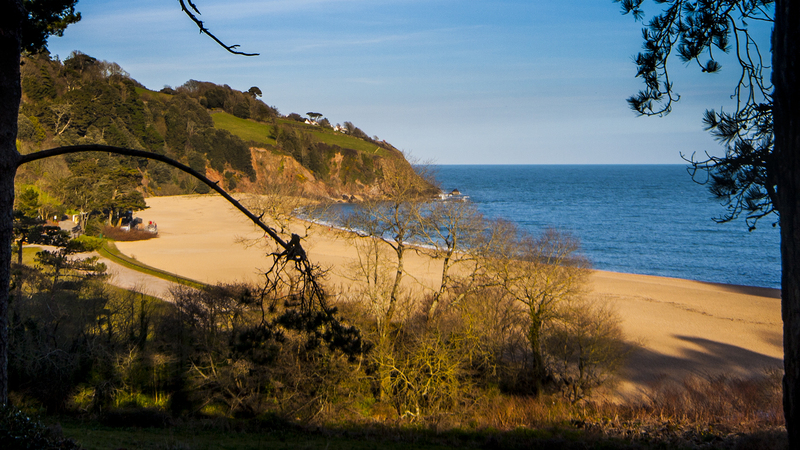 One of my favourite spots in the south west of Eng­land is Ban­tham, Devon. 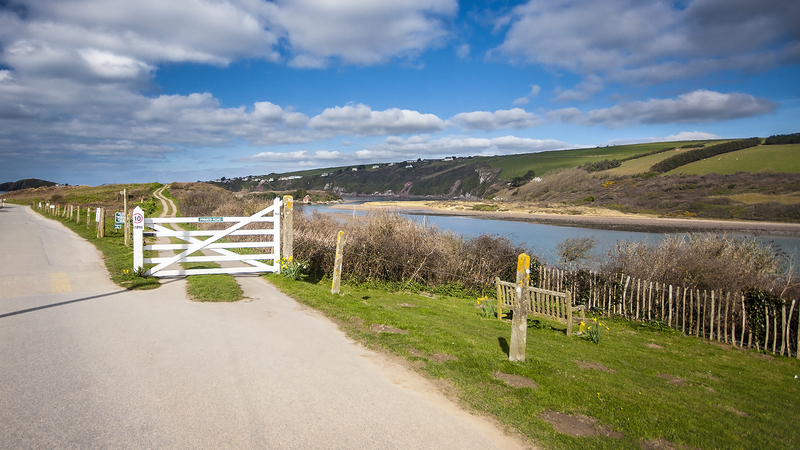 The sur­round­ing coun­try­side is topped only by a fan­tas­tic beach at the mouth of the Riv­er Avon. When it comes to surf­ing, I’m no pro, far from it in fact, but occa­sion­al­ly it works for me and due to lack of fit­ness and rid­ing a long board, I tend to like the small­er waves. With the fore­cast show­ing a nice 2 foot wave with a gen­tle off­shore wind it was an oppor­tu­ni­ty that couldn’t be missed. Although it would have been nice to stay the night in Ban­tham, espe­cial­ly as there is a great lit­tle camp site just up the road from the vil­lage where I’ve stayed before, it’s some­times more eco­nom­ic to take a day trip when get­ting in a surf ses­sion, par­tic­u­lar­ly as I can share the fuel costs with my mate Dave (aka David as he prefers to be called). 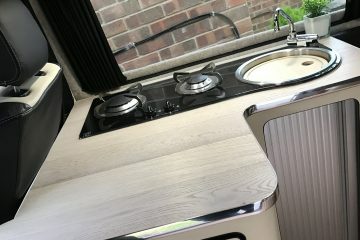 It just means the day needs a bit of plan­ning and get­ting every­thing ready the day before so I thought I would add this post to show how a day trip can pan out and share a recipe that is brim­ming with com­fort and easy to cook up and eat when out for the day. Of course, any part of the recipe pro­vid­ed can be replaced, I doubt I’ll go to the trou­ble of bak­ing my own rolls again, but the rel­ish is a def­i­nite for the future. 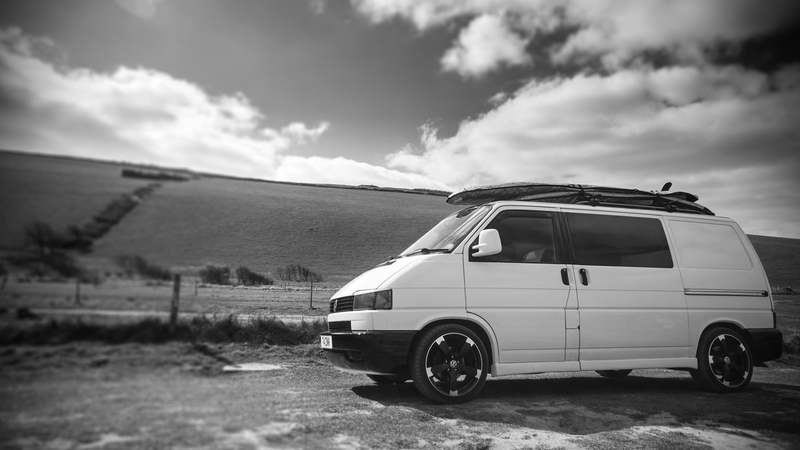 Being that Ban­tham is over 100 miles from home, it’s worth start­ing out ear­ly so we were on the road by 7.30am and head­ing off down the A303. Break­fast was sim­ple, just a bowl of por­ridge before leav­ing home. Part of the rea­son for the ear­ly start was not just to get in the water as soon as pos­si­ble, the plan was to be out of the water and eat­ing lunch when the big game between Man­ches­ter Unit­ed and Liv­er­pool kicked off at 1.30pm. So, after a stop off at Exeter ser­vices on the way, we arrived in Batham at around 10.15am and the sun was shin­ing. 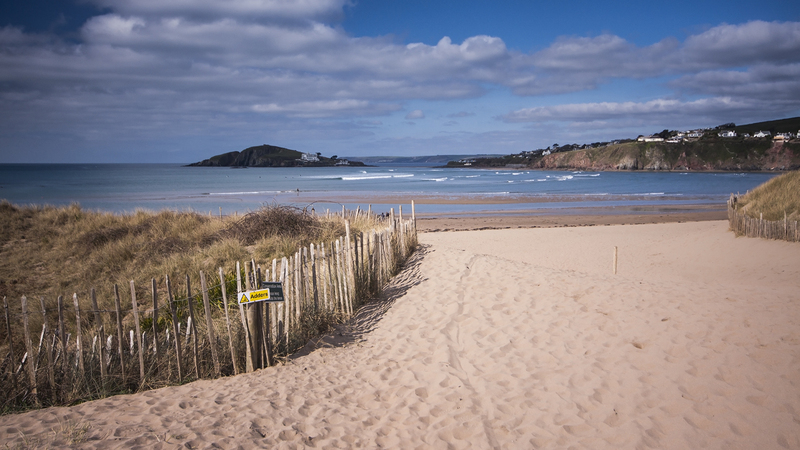 After park­ing up at the beach car park we had a quick peak over the sand dunes and it was look­ing good, per­fect for our long­boards. It wasn’t long before we were in the water, hood­ed up with boots and gloves too as the water is still only around 10°C. Per­son­al­ly I start­ed out pret­ty poor­ly as I have been a lot late­ly, I couldn’t get on any waves but as time went on we start­ed find­ing a few nice spots and I had a few good rides in. The waves were only 1–2 foot, with the odd 3 foot com­ing through so it was rel­a­tive­ly tame. Towards what would have been the end of our ses­sion is when things got a lit­tle more inter­est­ing. We were grouped up with a few oth­er surfers on what seemed to be the best spot at the time but sud­den­ly we were all took off away from the beach, caught in a sud­den rip which I don’t think any­one expect­ed on a small wave day. I think it had some­thing to do with the low spring tides, just 0.8m and it was near­ly at it’s low­est point. I’m guess­ing all of the water in the bay was try­ing to get out through a rel­a­tive­ly small area and unlike usu­al, the rip was going off down the coast, not back into the bay which meant a few of us had a long pad­dle back. After what seemed like ages pad­dling across the bay to get out of the rip I was approach­ing a group of kayaks, one had already helped anoth­er lad back so as I was pret­ty much spent I thought I’d swal­low my pride and ask for a cheeky tow and thank­ful­ly it got me back to the break­ers (lit­tle peel­ers real­ly), thanks again who­ev­er you are. Once I got to my feet we got out and called it a day, besides, we had burg­ers to eat and the foot­ball was about to start. The prob­lem with watch­ing the game is that there is no 3G sig­nal at Ban­tham so we went over to Slap­ton Sands, I watch TV when I’m away on my iPad over the Inter­net with var­i­ous Apps, I was lucky to get one of the only avail­able unlim­it­ed Inter­net pack­ages with full teth­er­ing too so can use my iPhone as a kind of router for my iPad and Lap­top if I take it. 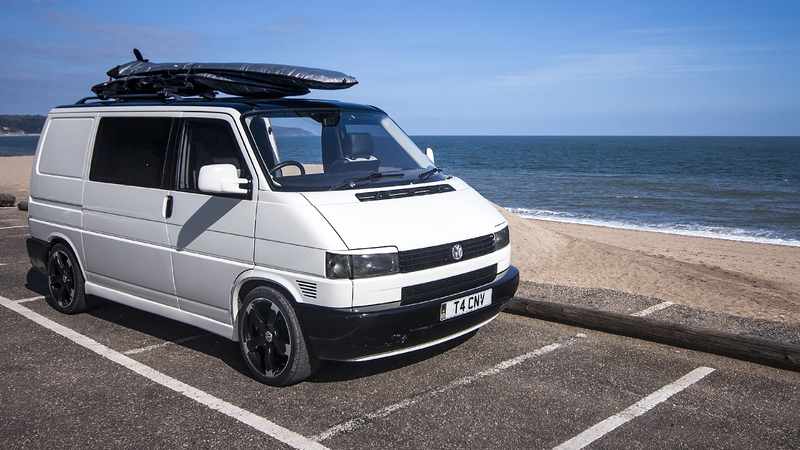 Slap­ton Memo­r­i­al car park is right on the beach in a beau­ti­ful spot beside the Slap­ton Ley. 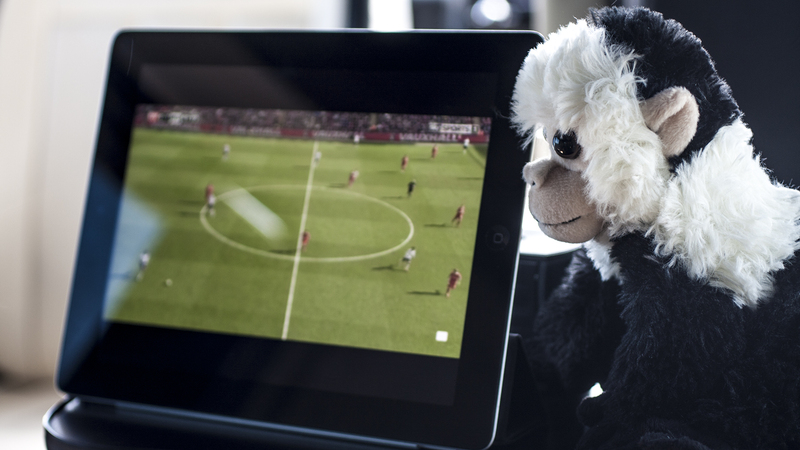 With the iPad set up, it was time to relax, have a cof­fee and hope­ful­ly see Utd bring home the 3 points they so need­ed. The orig­i­nal plan was to have the burg­ers before the game but as we end­ed up run­ning a bit late we decid­ed to wait until after, that gave us a chance to chill out for a bit too, though not much chill­ing watch­ing that game, lol. Once we had eat­en our burg­ers we got set for the jour­ney home, it was now late after­noon so we wouldn’t be back until evening. 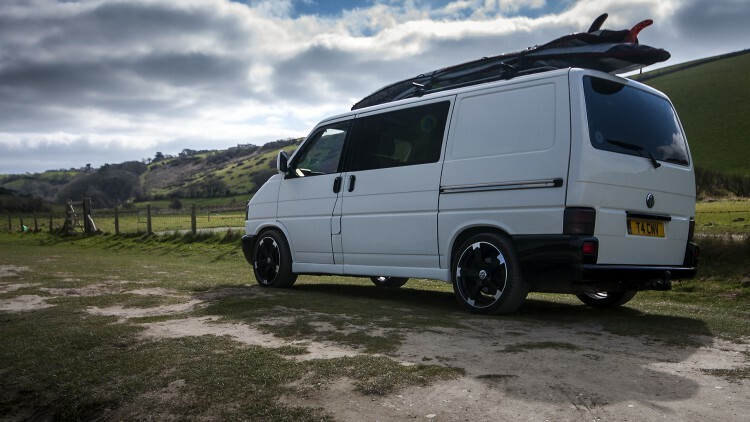 Despite it only being around 8°C, we couldn’t resist an ice cream from the res­i­dent ice cream van before hit­ting the road, for a while head­ing along the coast which has some great views. Heat a lit­tle oil in a small pan and cook the onions for a few min­utes on a low heat until soft­ened, stir­ring occa­sion­al­ly. Add the toma­toes and gar­lic, mix well. 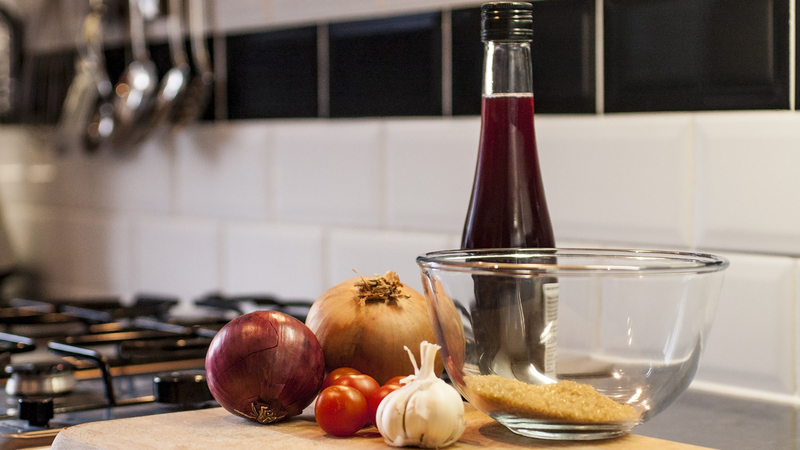 Then add the sug­ar, toma­to purée and vine­gar and bring to the boil. Sim­mer for 20–30 min­utes until the mix­ture is thick like a paste, stir­ring more towards the end to avoid the mix­ture stick­ing to the pan. Sea­son to taste with a small amount of salt and set aside to cool. 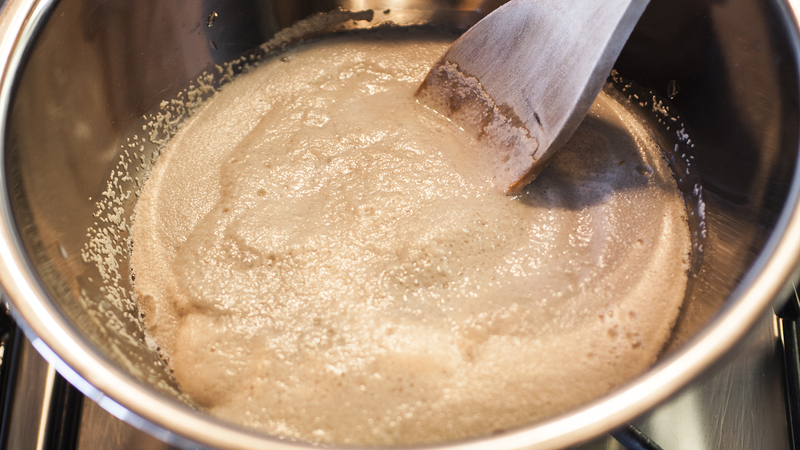 Mix the warm water, yeast, warm milk and sug­ar in a bowl and leave to stand for 5 min­utes. The mix should become frothy, this is how you know the yeast is work­ing. Pour the flour and salt into a large mix­ing bowl and add the but­ter, rub­bing togeth­er with your fin­ger­tips until the mix­ture is like fine bread­crumbs. Form a small well in the cen­tre of the but­tery flour and add the warm yeast mix­ture and eggs. For the purist, using your hands, mix into a sticky dough. If it feels wet, it will come togeth­er when knead­ing. When done, tip the dough onto a floured work sur­face. I per­son­al­ly cheat at this point and trans­fer to my bread mak­er on dough mak­ing mode for around 30 min­utes which is a lot less messy on the hands, then skip to step 6. Knead the dough for 10 min­utes, stretch­ing it on the work sur­face. Note, it will still be sticky at this stage but don’t be tempt­ed to add too much flour. When done, the dough should feel soft and have a bounce to it. Place in an oiled bowl and cov­er with cling film or a tea tow­el, then set aside to rise for 1–3 hours or until it is dou­ble the orig­i­nal size. 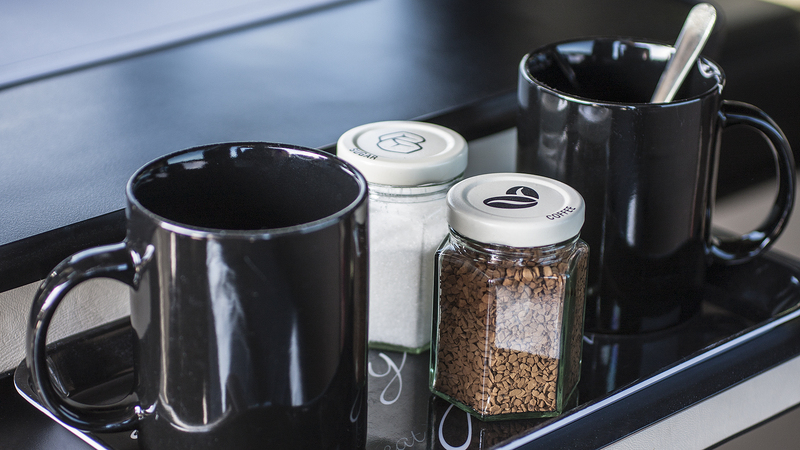 Tim­ing will vary depend­ing on the tem­per­a­ture, if your kitchen is not very warm, per­haps make space in an air­ing cup­board. Once the dough has dou­bled in size, knock the air out and knead again for 2 min­utes. The dough should now be much less sticky, but may need a lit­tle flour added. Divide the dough into 6 even pieces and flat­ten each piece like a pan­cake on a floured sur­face, turn in each cor­ner to the cen­tre until the ball is sealed, then flip it over and use your hands to gen­tly roll into a smooth ball. 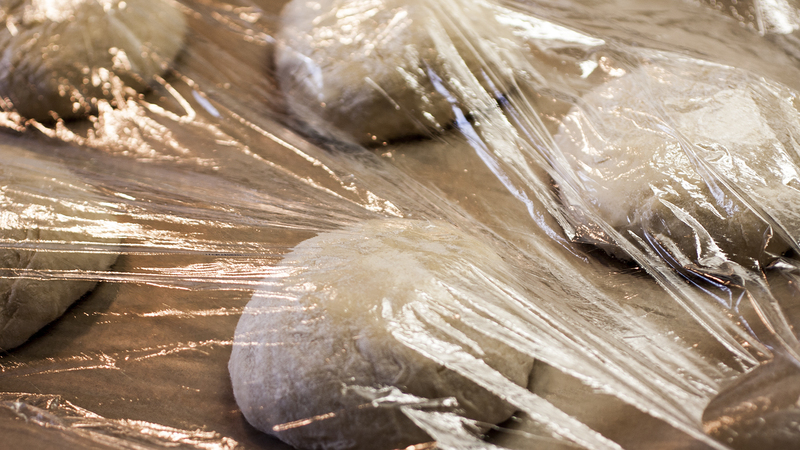 Add the grease­proof paper to a bak­ing tray and place the dough on the tray. Loose­ly cov­er with oiled cling film and leave for about 1 hour or until dou­bled in size again. Then, heat the oven to 200°C (180°C for fan ovens) / gas 6 and place a shal­low bak­ing tray at the bot­tom. Pour a cup of water into the bak­ing tray at the bot­tom of the oven to cre­ate steam before the buns are put in. 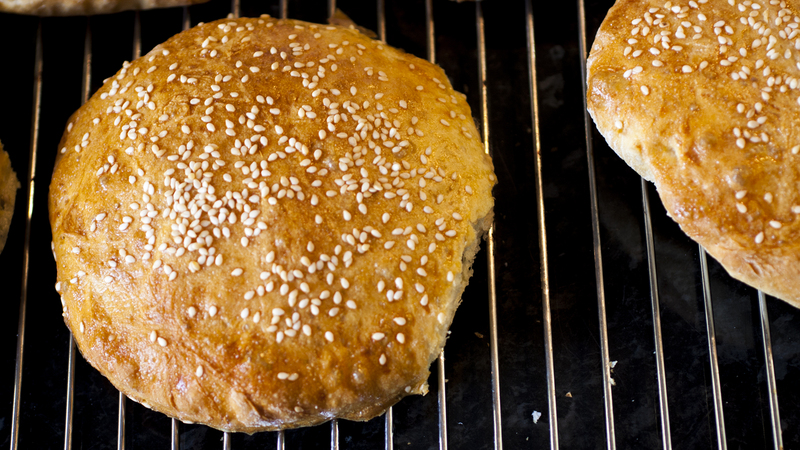 Remove the cling film, brush the buns with egg and sprin­kle with sesame seeds. Bake for 20 min­utes or until gold­en in the cen­tre of the oven, then remove and leave to cool on a wire rack. 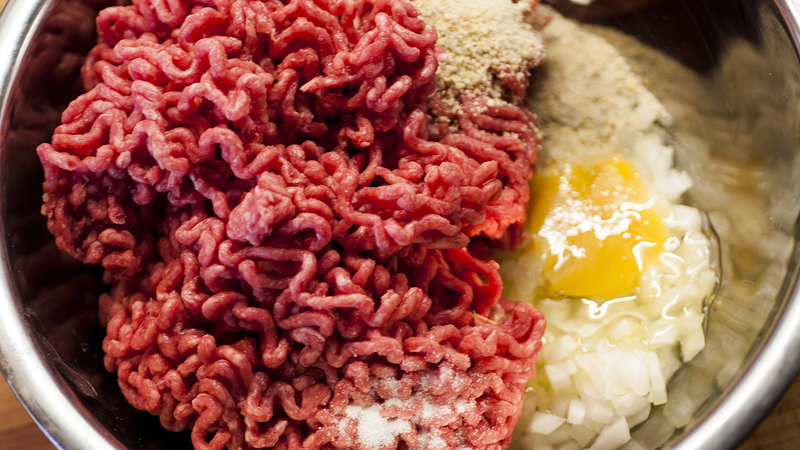 In a bowl, mix the mince, egg, onion, bread crumbs and salt until well blend­ed. Divide the mix­ture into four equal por­tions and shape each into a pat­ty about 10cm wide. 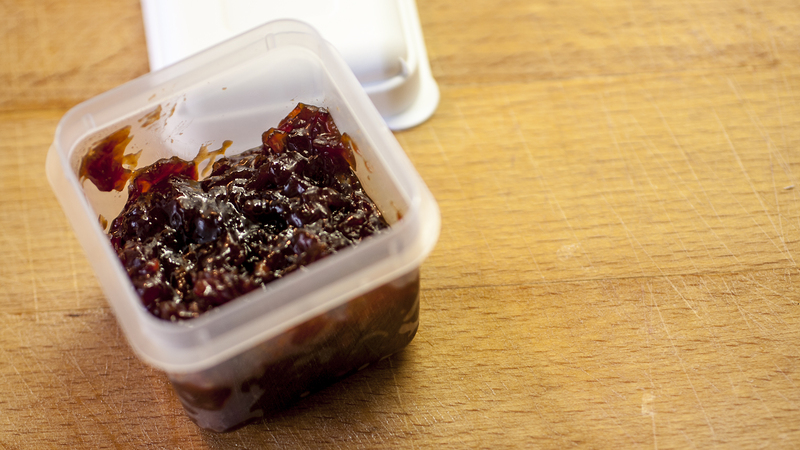 Place the pat­ties onto a tray that wil fit into your van’s fridge and cov­er in cling film. 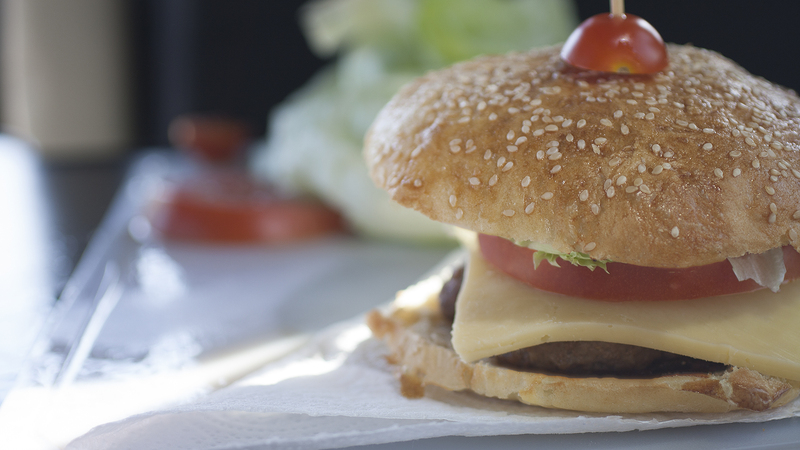 To cook burg­ers, remove from tray and heat a lit­tle oil in a fry­ing pan. If using bacon as a top­ping, add a lit­tle oil to a sep­a­rate pan and cook until gold­en-brown. 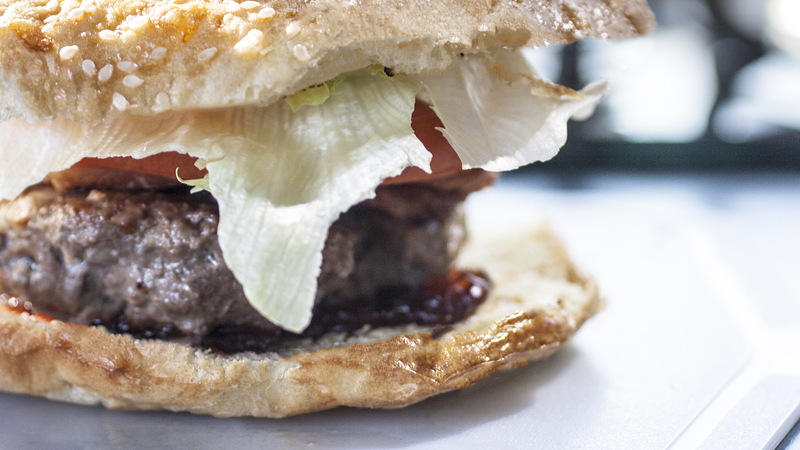 Turn the burg­ers once only, cook­ing for about 5–6 min­utes each side. (Alter­na­tive­ly if you have the lux­u­ry of a grill in your van, you can cook them under a grill for the same time turn­ing half way through). All the ingre­di­ents in a bowl ready to mix. To serve, slice the buns in half and hov­er over the flame of the hob to toast a the inner side a lit­tle, being care­ful not to burn your­self. Place the buns toast­ed side up onto serv­ing plates and add some of the rel­ish, then the burg­er pat­ties, top with a lit­tle more rel­ish and your addi­tion­al choice of top­pings. Cov­er with the top side of the bun and pierce through with half of a wood­en skew­er, per­haps topped off with half a cher­ry toma­to.